Majority of Home/Business Security Systems today uses cellular technology to remotely communicate with these system and devices. if the Alarm System was set-up to report activity via text messaging then users will be notified via text messages. Another example, every time the system is Arm/DisArm, a text or voice call is transmitted remotely depending on how the system was set-up. No Contract / No Credit Check /No Activation fee. Easy activation. SIM is TRI-CUT, Standard SIM, Micro SIM and Nano SIM. Just punch out the size you need for your wireless device. Nationwide lightning fast 2G, 3G & 4G LTE service on GSM Network. Enjoy 250 units monthly for 6 months. Each unit can be used for any combination oif Talk/Text/Data. 250 minutes or 250 texts or 250 MB data. 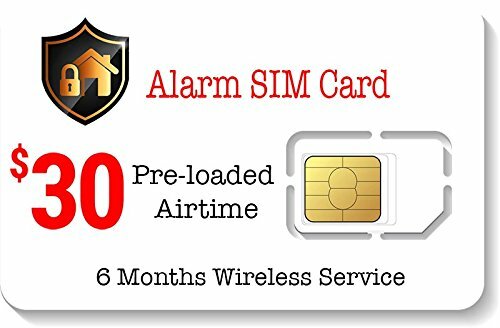 Supports majority of home/business GSM Alarm Systems. No Activation fee. No Credit Check. No Contract. Taxes Included.